Our athletics programs are second to none in the camping world. The goal for our athletics programs are to put our campers in a position to succeed no matter their background or level of experience. If you want to try a new sport for the first time, do it! If you’re already a pro, play on our Wayne County Tournament teams and compete against other camps. Want individual attention? Simply just let us know! We never charge extra for private lessons, because of our size, if you want individual attention in a sport, our sporting directors and specialists are more than happy to work with you one-on-one in the morning, during rest hour, or downtime in the afternoon. Come take a shot. Our basketball program balances a team first approach to working on your game, combining individual scoring skills with great passing and defensive fundamentals. 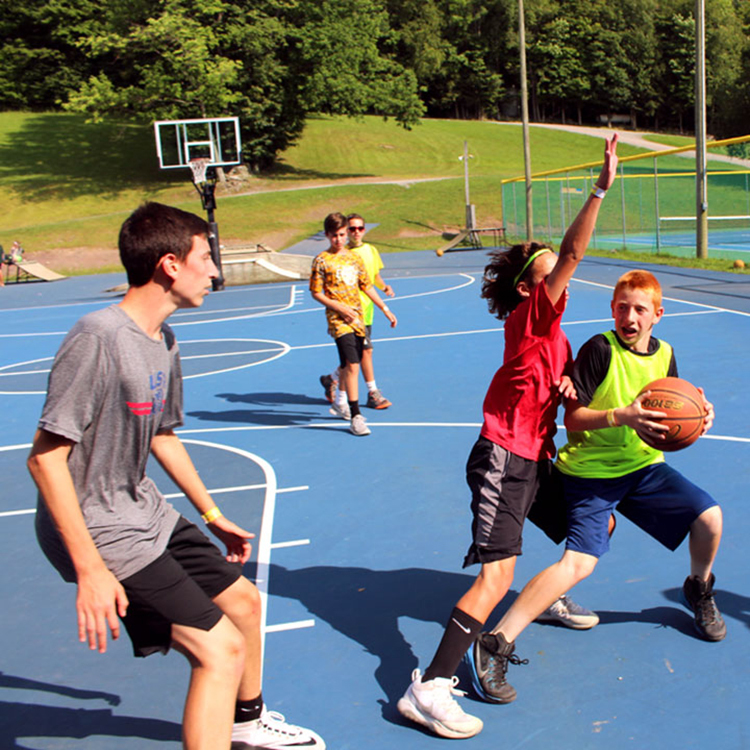 Our basketball program is historically one of our most popular activities at camp, and players at all skill levels are welcome. Our sports directors are college coaches and instructors who have years of experience teaching their specified areas so no matter your skill level, we have the ability to help you achieve your goals. Our sports specialists are college athletes or recent college graduates who have experience with individual sports at the highest levels, and who have a devoted passion to helping children develop both their athletic skills, and their sportsmanship. Is all that not enough? Well don’t worry, we also offer the ability for our campers to play in USTA tennis tournaments and USGA golf tournaments (for an additional fee). During the winter, our families often get together their camp friends to play on different sports teams, keeping the camp feeling 12 months a year. An additional text description can go on this line here and also on this line as well. Get in touch with our owners, directly. © 2019 Camp Tioga. All rights reserved.